It is exciting to see the many creative ways that gardening enthusiasts help keep the legacy of Elizabeth Lord and Edith Schryver alive! 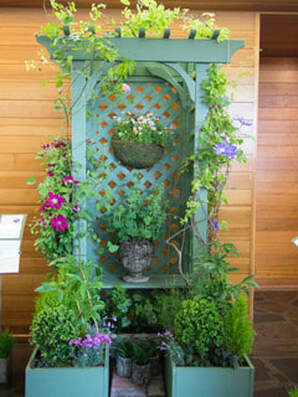 We just learned that Jean Roth, long-time Portland Garden Club member and friend of the Lord & Schryver Conservancy, won Best in Show in the Garden Club of America’s Inspirations 2014 competition for her L&S urban garden vignette. Jean entered her design in the Horticulture Division; Class 10 – Urban Jewels. 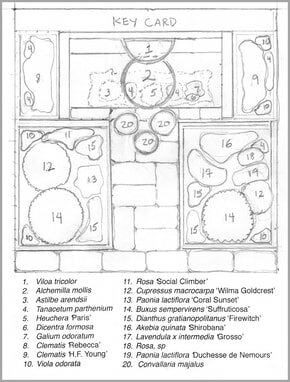 Per the Garden Club of America’s rules, in addition to the actual display, Jean was also required to submit a Statement of Intent, a key card (planting diagram) and plant list. 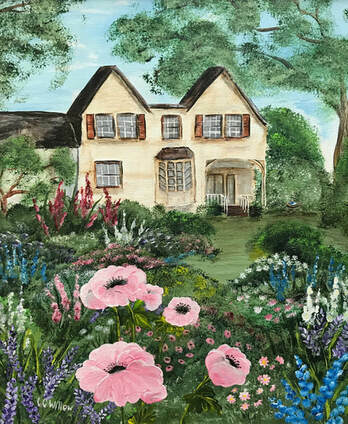 Thank you to the artists for allowing us post their paintings which resulted from PAINT THE TOWN , a project of Artist in Action (AiA) which included Gaiety Hollow in their list of plein air inspirational art locations in 2018. Top: Gaiety Hollow Poppies by CC. 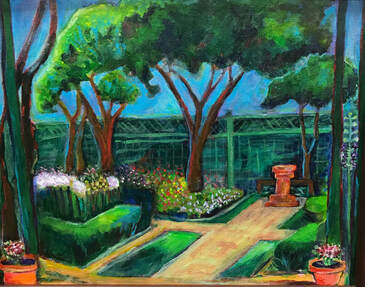 Willow, acrylic on canvas, 16" x 20"
~ Elizabeth Lord (1887-1976) and Edith Schryver (1901-1984). their garden, one of 250 they designed together. by working men? or, by the owner-women, in slippers and peignoirs? bring, with every glimpse, a released breath? is lost to us, a stony pact within their legacy, their era guarding privacy. stalk of creamy bells—in Edith’s room of memory, a taller, more precious bloom. and sweet alyssum and purple veronica. All else in shadow. When I sold our house thirteen years ago and vacuumed the living room carpet for the last time, I found a small red Lego against the baseboard and picked it up, knowing my future self would need that piece of the past, viewing the scene as if through water, as if through mist, as if on the screen of another mother’s film. scrub jay, junco, chickadee, crow. All hushed with historic heat. ​red-orange radiant in the garden. “I’m glad I have a mother like you,” Elliot said yesterday from his swivel stool in the kitchen. I took a moment to think. “Thank you. I work at it.” “I know,” he said. I added, “And I haven’t always been like this.” “I know,” he said again. And his beacon blue-green eyes looked into mine. We have had our shares of darkness and anger, shadow and sorrow. as water trebled behind a green lattice fence. around the left side of the house. Then stillness.